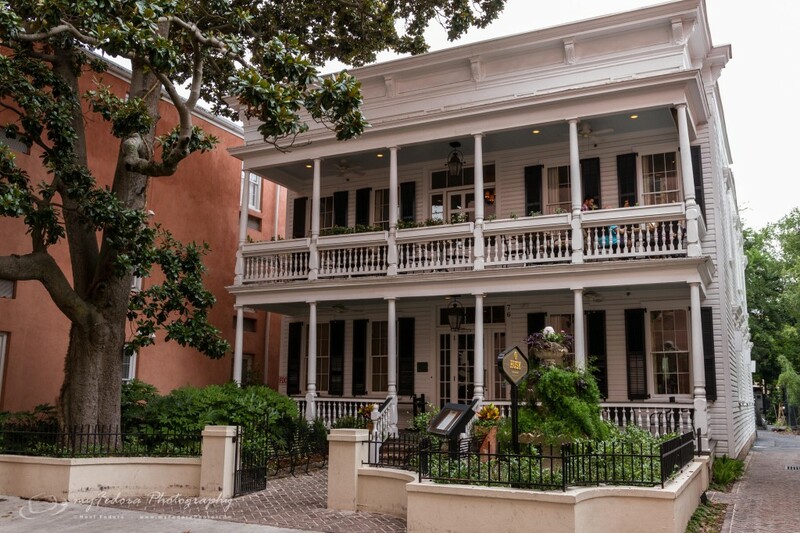 While visiting my family in Columbia, South Carolina, we decided to take a one night field trip to Charleston. 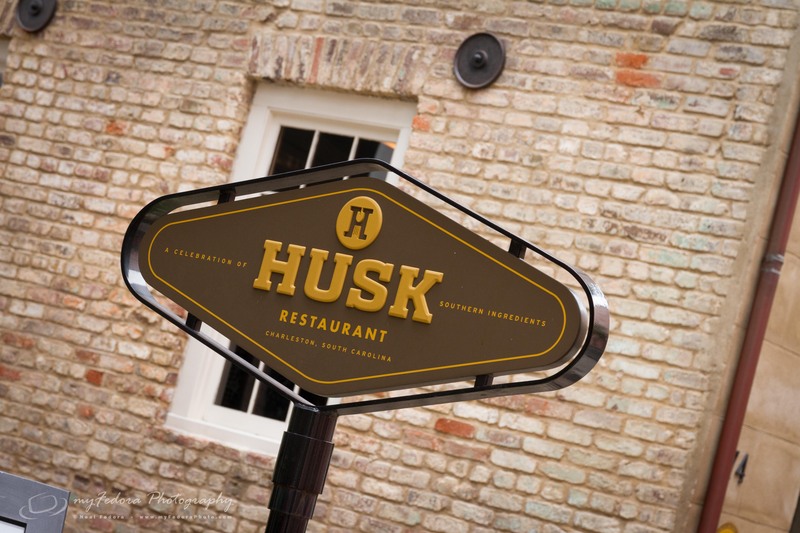 Knowing that I was going there, my brother recommended the restaurant Husk, which won 2011 Best New Restaurant in America from Bon Appetit magazine and 2011 Best New Restaurant in the South from Southern Living magazine. 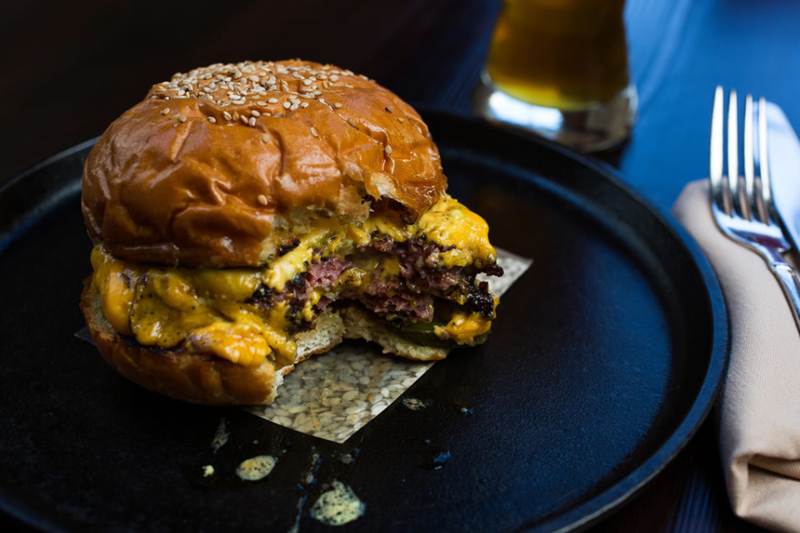 The restaurant is the creation of award winning Chef Sean Brock and owned and operated by the Neighborhood Dining Group (NDG). 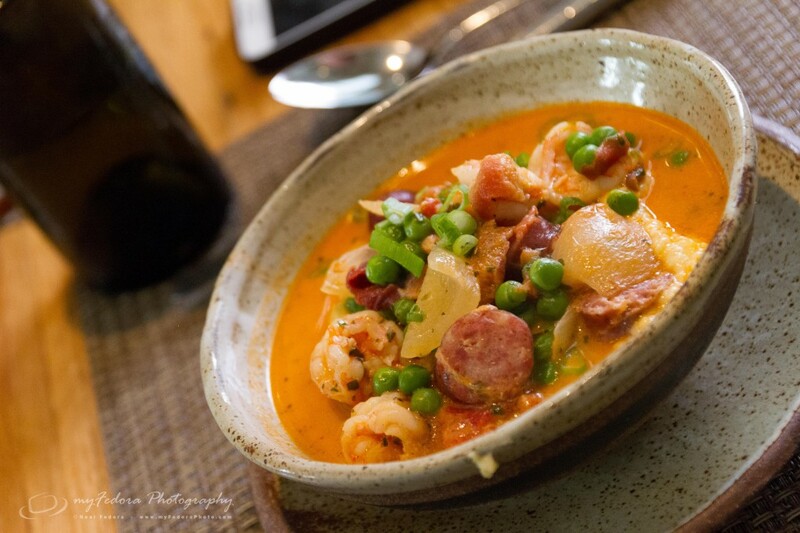 What makes this restaurant unique is how it brands itself on using fresh, local ingredients to create extraordinary southern inspired recipes. 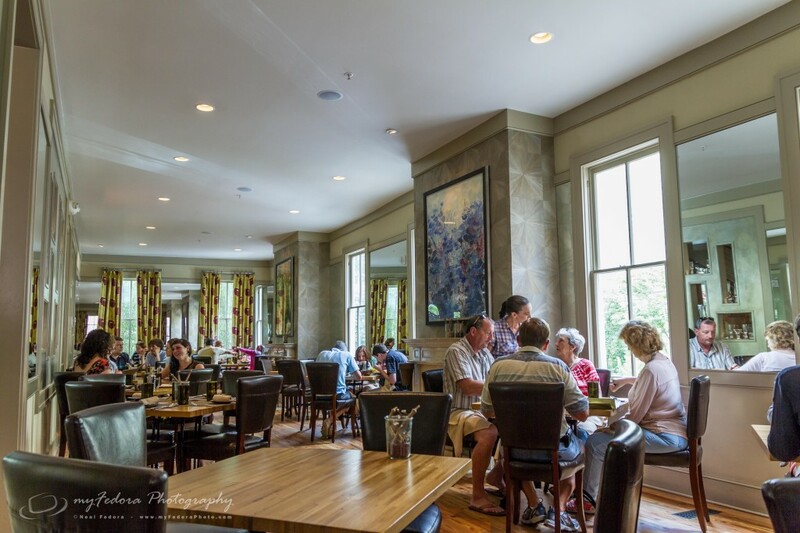 With a menu that is updated daily depending upon the local ingredients available, this centrally located Charleston restaurant provides an ever changing, casual culinary experience. We made reservations for lunch and what a lunch it was! I love to eat, especially fresh, flavorful, balanced creations that are part experience and part sustenance. The menu for the day had numerous delightful gems as shown below. 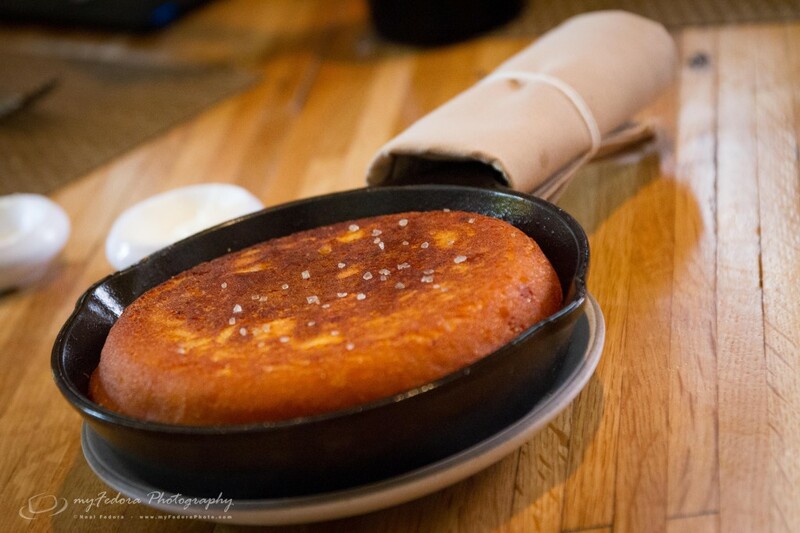 Asking our server for recommendations, she advised us on the burger, shrimp and grits and the heritage pork. 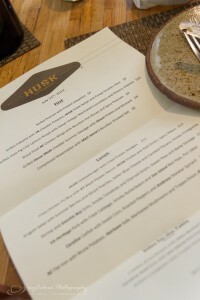 In addition to the food, Husk had an extensive wine, beer and soda list as well. 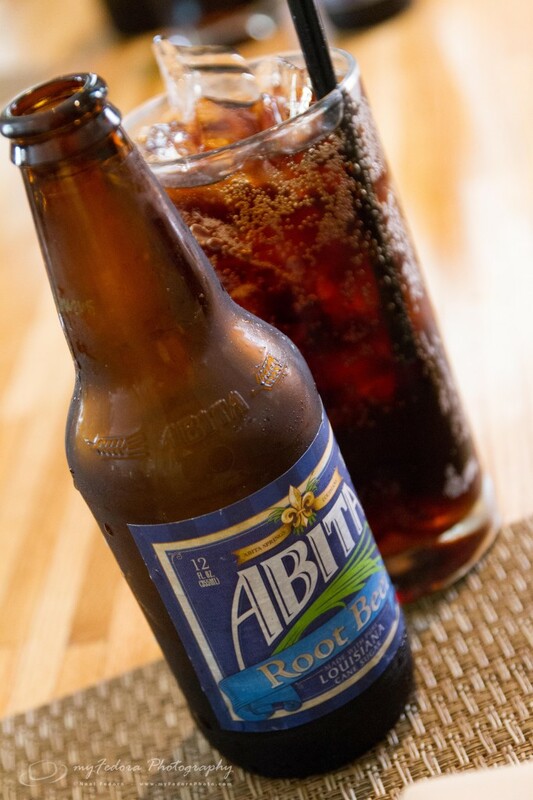 Unfortunately they were out of the North Carolina Cheerwine, so I had to settle on Abita Root Beer instead. 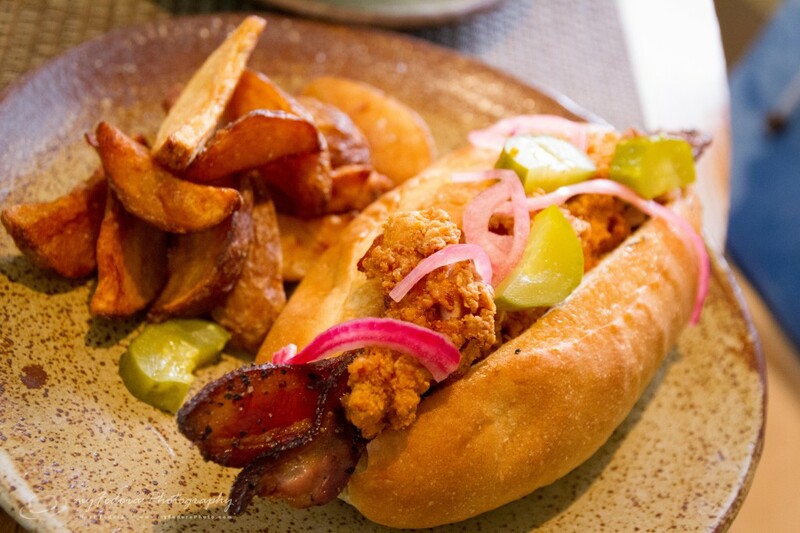 Bring on the glutenous feast of southern culinary delight! 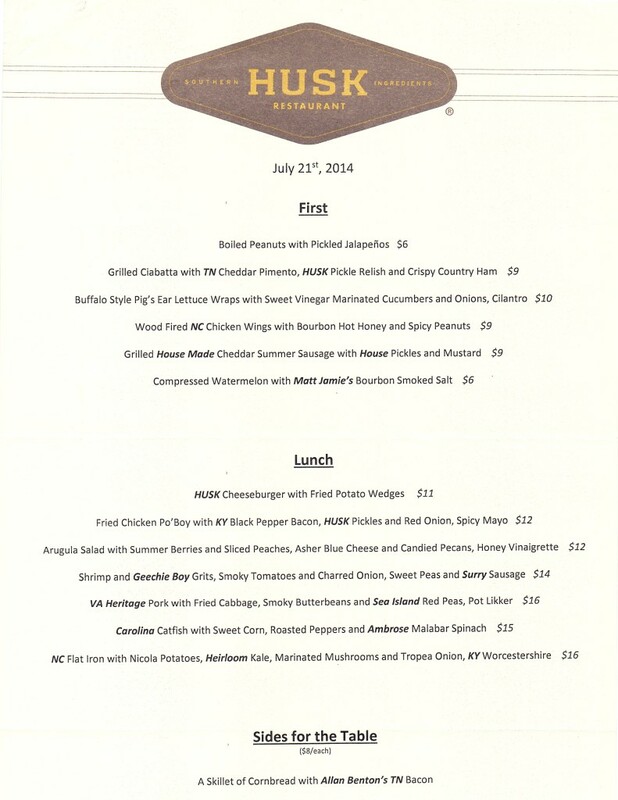 The Lunch Menu from July 21st, 2014. The sausage had an amazing smoked flavor from the grill. 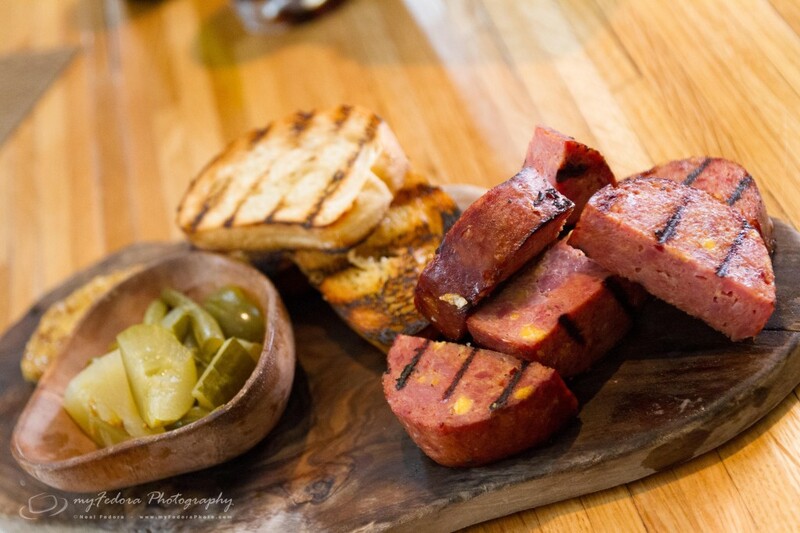 The cheddar was subtle, but added just the little bit extra to the smoked sausage. The pickles, mustard and toasted bread really rounded out the appetizer by diversifying the taste and texture. Absolutely amazing. Wow did those ingredients just fit together perfectly, creating amazing convolution of texture and taste again. The gravy wasn’t too heavy, with minor flavor so you can still taste all of the other ingredients in this bowl of foodie heaven. Not sure what sauce is on this, but it was really an amazing burger. The chicken was good, but nothing special. However, the bacon, what a great enhancement to this typically boring sandwich. The mayo was rather spicy, but really good compliment to the meats. 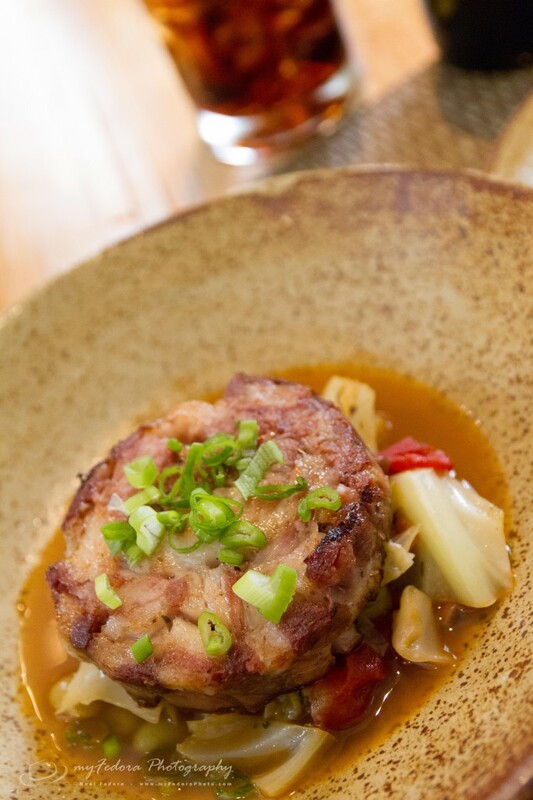 Virginia Heritage Pork with Fried Cabbage, Smoky Butterbeans and Sea Island Red Peas, Pot Likker. The pork was slow cooked for 12+ hours, pulled apart and then wrapped around the stomach and cooked again. A slow cooked fatty goodness! Really tasty and again, another great example of the quiet dance of textures and taste among the ingredients. 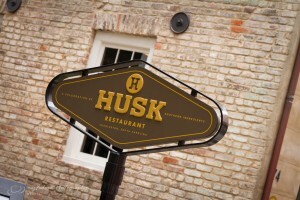 Located off of Queen Street in downtown Charleston, Husk resides in an old Victorian house. Supporting both floors for seating, the restaurant can support a decent amount of diners. If you didn’t make a reservation and you do have to wait, the rocking benches on the porch are really clever and make waiting for a table a bit more enjoyable. When I am in Los Angeles, California for work, I always try to visit Park’s Barbeque to clog my arteries with their perfectly marinated, tender and fresh Korean barbeque meats. It’s not a Travel Channel stop by Adam Richman or Anthony Bourdain, but it is an establishment that my colleague thankfully introduced me to and definitely worth a detour to this famous restaurant. And I do mean famous. As you walk in, you are greeted on the right with a wall full of celebrity photos. You have famous Asian sports stars, Olympians (Apolo Anton Ohno) and actors (extremely beautiful Jessica Alba for example). And how can we leave out an Executive for World of Warcraft who also made the wall of fame? Yes, all types, sizes and trades have tread their feet through those fish protected doors. 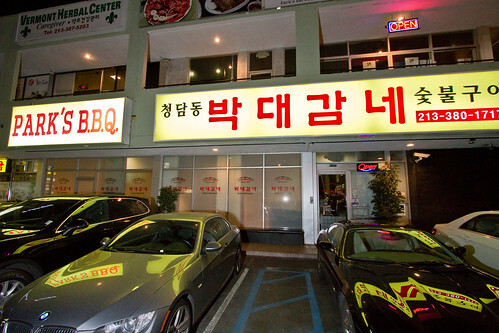 You can find this local, famous establishment at the following address in Koreatown, Los Angeles. So how about that atmosphere, service and food shall we? Outside Park’s Korean BBQ restaurant. They always have some nice cars parked out front and have valet parking should you go. I recommend parking on the side streets as it’s free. Walking in, you enter a small corridor of an entry with the restaurant on the left behind a 5foot half wall and 100 or so photos on the right of the famous personalities who dined at this place. 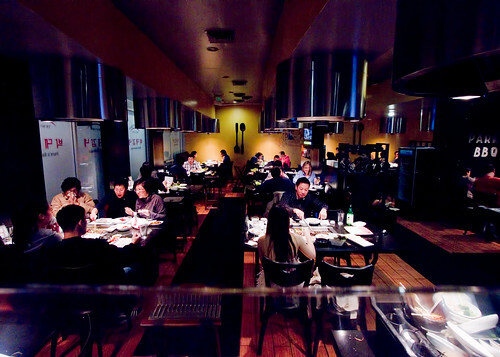 The restaurant is located in a strip mall and spans two floors. There’s valet out front, which you’ll have to do if you want to park in the front of the restaurant. You might have to compete with the expensive sports cars typically parked there though. You can find parking on the side streets instead, so take advantage of those free spots. Downstairs is nicer than upstairs (and from my experience you get better service). But, the restaurant is clean, busy and has great BBQ tables for cooking up those meaty morsels. 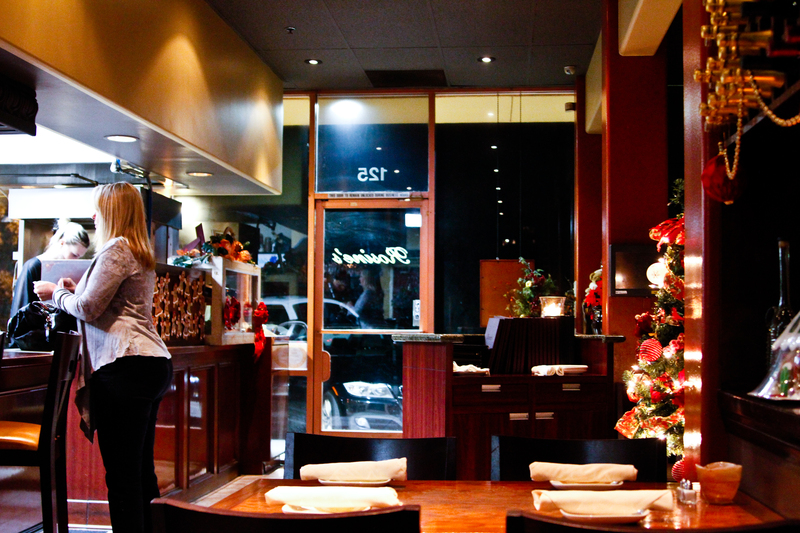 This is the view of the main floor right when you come into the restaurant and are greeted by the hostess. 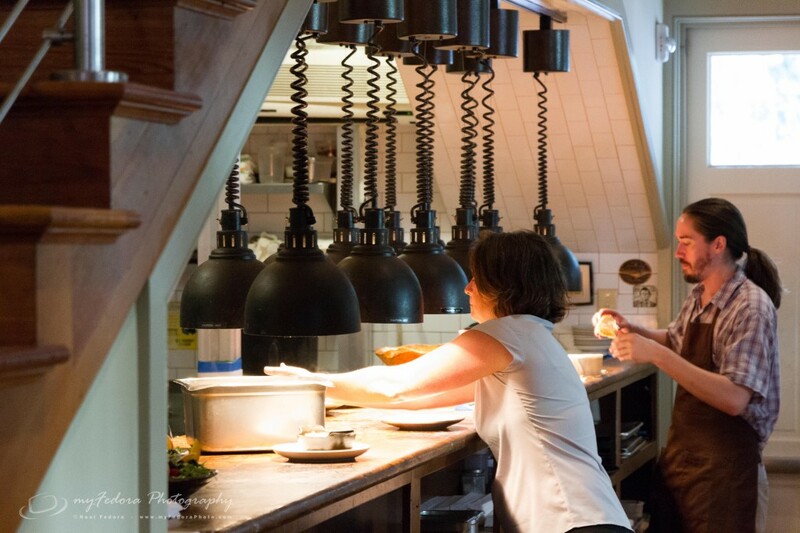 Service is usually very good, with the servers/cooks conscientious to your food and needs. 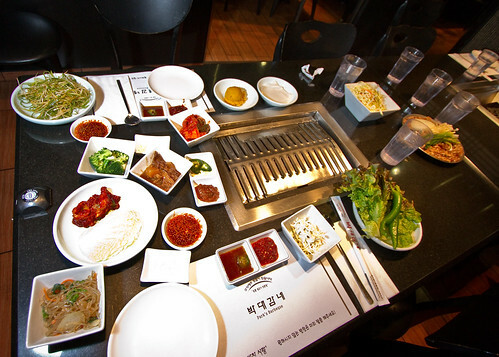 They are quick to bring out the included Korean side dishes and your main courses. Usually the servers are all very attentive and take turns throwing your food on the barbeque, cutting it up, flipping the meat and adding the vegetables. However, during our last trip (which happened to be Valentine’s Day) we had horrible service at our table upstairs. We usually sit downstairs and have always had great service, so I don’t know if it was the result of being busy, the upstairs service or some other vendetta against us. But, our water was never filled, food was left to burn and I had to ask for our check instead of them bringing it when we were clearly done for quite some time. Really disappointing for this type of restaurant. Again, the service is usually much better, but this did leave a terrible taste in our mouths for sure. I did not return on that trip, although I am sure I will sometime in the future to give it one more shot. 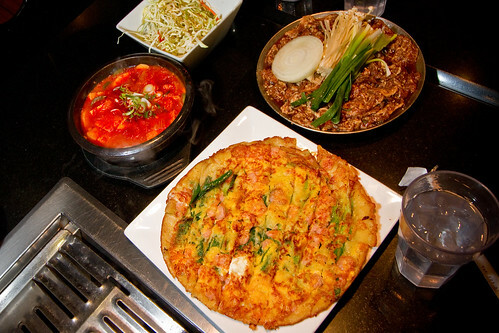 If not familiar with Korean food, the menu can be a bit daunting. 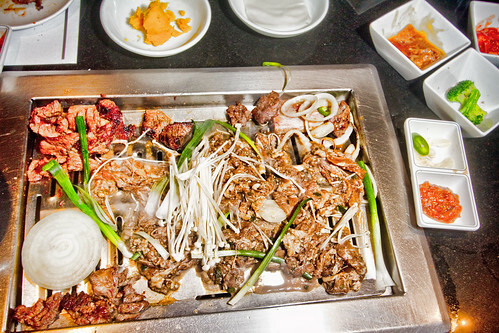 Thankfully I was introduced to the place by someone much more familiar with Korean barbeques. Once you get there and sit down, you are greeted by the complimentary spread of various Korean side dishes such as numerous kimchi dishes, rice noodles, sauteed broccoli rabe, sauteed sea plant, marinated radish, Korean coleslaw, wonton wrappers, cabbage and other odds and sods that they decide to bring as it changes some each time you go. These are the free Korean side dishes you receive prior to your succulent meat gorgefest. They get you started with various kimchi dishes, rice noodles, sauteed broccoli rabe, sauteed sea plant, marinated radish, Korean coleslaw, wonton wrappers, cabbage and other odds and sods that they decide to bring as it changes some each time you go. Once you get past the party in your mouth Korean side dishes, it’s onto the main courses. They don’t hesitate to start delivering these in a well oiled assembly line fashion. Without much delay, the raw beef entrees, Seafood Pancake and Kimchi Stew and sticky rice come out. The pancake is like a thin, dense (you can use chopsticks to pick up the pieces) seafood frittata filled with rock shrimp, green onions, and asparagus that you dip in a mild soy sauce. Then the scrumptious Kimchi Stew, full of spicy kimchi seasoning, beef and pork part and cabbage that you scoop over your sticky rice and indulge. These lovely morsels are the Kimchi Stew on the left, Bulgogi (Seasoned Sliced Beef) top right and Pancake with rock shrimp and green onion on the bottom center. Then there’s the beef. Yes, those wonderful marbleized bovine morsels that are flown in daily for as fresh as you can get. Our staples tend to be the Bulgogi and Gal-Bi. 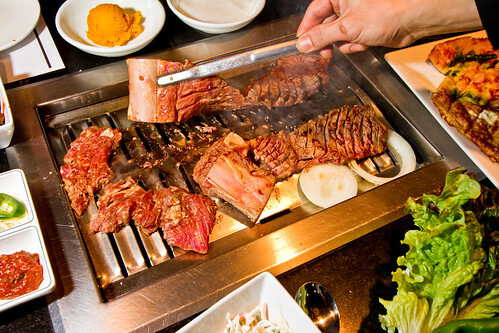 Bulgogi shown above, is a delicious thinly sliced sirloin/prime cut beef that is marinated to perfection. Served with some grilled garlic, scallions and enokitake mushroom, quite a delightful combination. Unless they get fried like our last visit when they neglected our table. Note, you can grab the utensils yourself and flip them if Park’s employees are attentive to it. Oh those lovely marinated prime beef short ribs, Gal-Bi (aka Galbi). Short ribs tend to be tough and difficult to come out tender, but Park’s has it down perfectly. They thinly cut the spare ribs around the bone so the chef can just unroll the meat on the grill. In addition, the meat is scored so that the marinade just gets sucked into the meat. They grill them unrolled for a little while before getting the good o’l kitchen scissors and cut up the meat. The part of the meat closest to the bone is the toughest though, so focus on the other tender chopstick size pieces first. 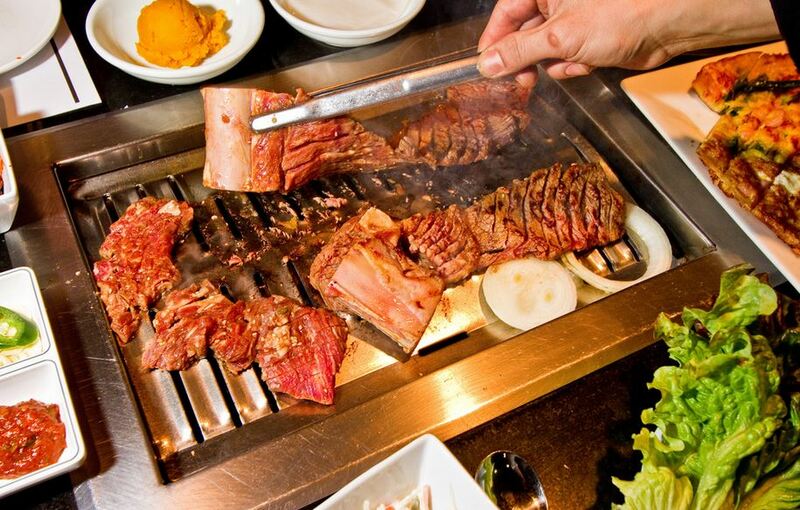 This is the scrumptious Bulgogi (marinated sliced sirloin/prime beef). These short ribs (Gal-Bi) are full of flavor, tender and oh so good! I have also had the fish and special pork belly. The fish was just alright. The pork belly was good, but just thick bacon really. I would stick with the beef. I had some time to kill before flying out of Hilo International Airport (ITO) and wanted to find a good local place to eat. Taking advantage of my smartphone, I performed a local restaurant search for around Hilo. When I travel and am looking for a restaurant, I tend to base my restaurant selection by the number of review stars on Google and of course, the style of restaurant that I am in the mood for. Lo and behold, Ken’s House of Pancakes popped up with a respectable 4 stars. Doing a quick search, this acclaimed diner seemed to fit my bill perfectly. 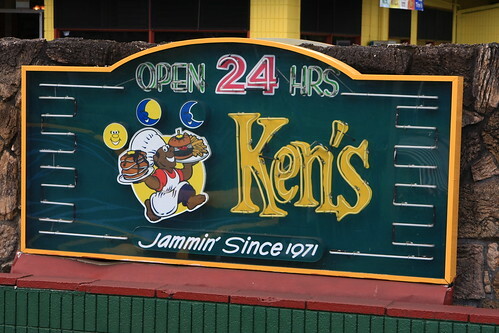 So I headed to Ken’s. Being a diner, the atmosphere is well, a diner. Walking into the restaurant you are welcomed by the bright diner interior, large diner bar and many busy tables. This place is busy, so get there early. The good thing is, being a diner they can flip the tables fast so they keep customers moving through. I lucked out as I was traveling alone and was able to snag an empty stool at the bar. It’s worth noting that parking is very limited. There are a good deal of spots out front, but not near enough for all of the customers. Not to mention since the restaurant is on the corner of a busy intersection, getting in and out of the parking lot can be a pain. 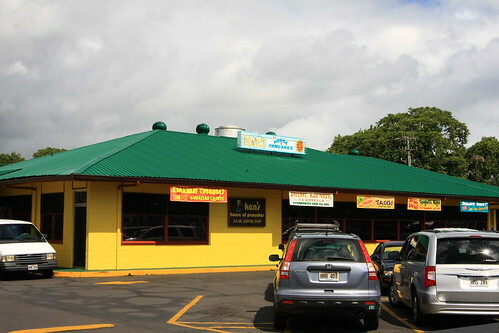 Especially if you are like me and missed the restaurant as I couldn’t get over and make the turn in time off Kamehameha Ave. I ended up parking behind Ken’s in the medium size business building just off Kanoelehua Ave. It was quite and had a good deal of empty spots and just a short walk on the sidewalk down Kanoelehua Ave. to get to Ken’s. The service was great. The waitress behind the bar was friendly, fast and kept my coffee full. No complaints. What a large menu! I have to say, I like options but I felt like I could be there all day trying to decide what to order. I was traveling by myself and couldn’t narrow my choices to just one from the menu. 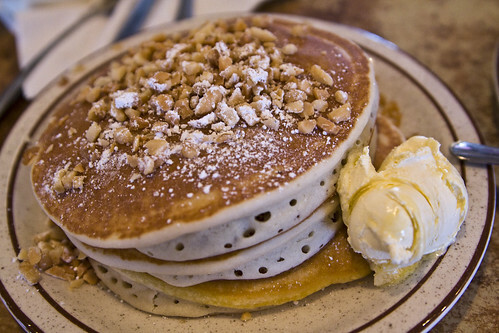 Being a ‘House of Pancakes’, I had to try their pancakes. And since I was just down from Mauna Loa, they had to be Macadamia Nut. These buttermilk beauties were quite heavenly I got to say. Especially when you combine these fluffy morsels with their kokonut, passion and guava flavored syrups. To balance it out, I had to get some egg meal as well. Alas, I settled on the very Hawaiian, and ‘Original’, Loco Moco. 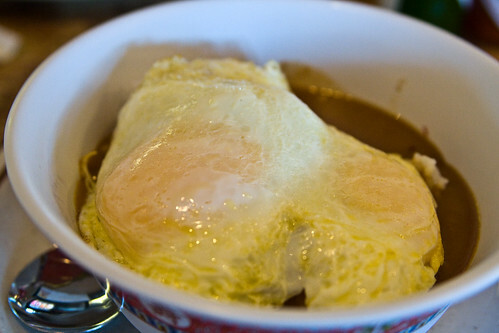 How can you go wrong with 2 scoops of rice, 5oz lean beef patty, brown gravy and 2 over easy eggs? Gravy was tasty and had good thickness. Rice was the yummy sticky rice. The beef was a bit dry, but hey, it’s a diner. Other items that looked divine were their other Moco’s with Spam, pulled pork, chili, etc. and their ‘famous’ omelettes that can be filled with just about anything, like crab, Spam, Chinese sausage, shrimp, Portuguese sausage, etc. Yes, I was a gluttonous fool. But my belly was happy. 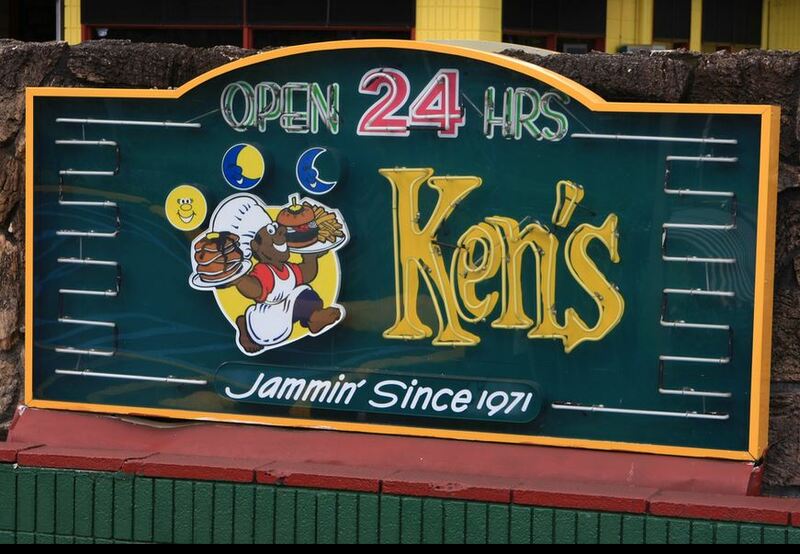 This little gem of a restaurant is located off the beaten track in Anaheim, California. Not really close to Disney or the Honda Center where the Anaheim Ducks play, one wouldn’t typically detour to the Yorba Linda, California area. I on the other hand am here several times a year as that’s where our office is. 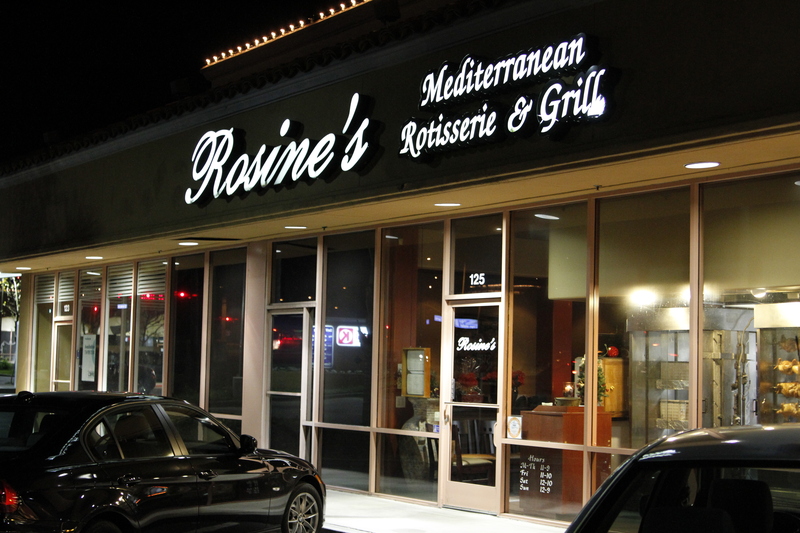 Rosine’s Mediterranean Cafe is a must stop on each trip. Opened in 1995 by home trained chef Rosine Najarian, this restaurant specializes in her Syrian and Lebanese influenced home cooked food. A splendid menu of broad, bold and rich items. Ah the garlic, rosemary, thyme, pepper and spices! A true party in your mouth for sure. And then there’s the wine selection, a wide array of unique wines from around the world including the owner’s homeland of Lebanon. Alright so let’s discuss the atmosphere, service and food…. The atmosphere is simple and quaint. A recent expansion into the building next door offers a good amount of seating and options for hosting functions. With an open kitchen and most of the seating nearby, it provides an intimate environment for diners at this family run establishment. It is located in a strip mall next to a Subway, with limited parking out front, but near unlimited parking behind the strip mall as it shares the parking lot with a grocery store and other stores and restaurants. Walking in this dim lit restaurant, you are welcomed by one of their servers dressed in black where you’ll be sat at one of the small wood tables. Usually there isn’t much of a wait, if any at all. Typically most of the people waiting in the entrance are awaiting their to-go pickup orders. They have a small stage in the dining area for someone to play some music. Although that may add to the atmosphere of this culinary escape, I do enjoy the quite mood of the place when dining and having a glass of wine. Whether you eat in or order take out, the service is prompt and friendly. They are happy to have you relax and enjoy your meal, wine or desert. So the service is really good. 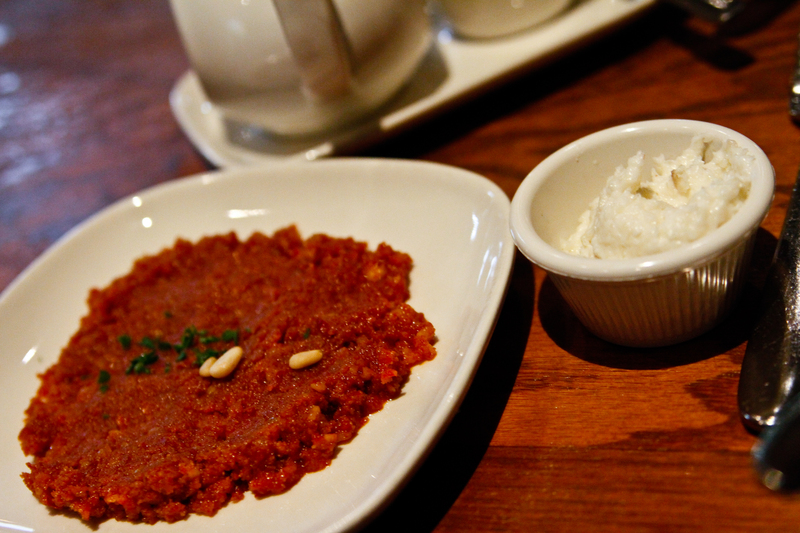 Maybe it’s because I eat alone usually, but when I go I really love their Muhammara, aka ‘Walnut Caviar’. So I always order a side of it. It’s happened a few times where one server will bring me the starter portion of it, which is a lot of food. I’m not sure if it’s a nonchalant up sale or not since it’s a few bucks more, so just specify you want the side portion if you order that or any of the other yummy sides. 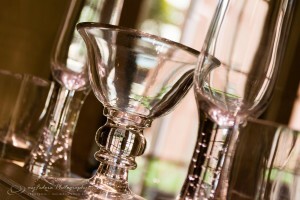 Still always good service though as they keep the glasses full and are timely in bringing the check. The menu is very diverse and unique, with menu options that really do transport you to the Mediterranean. Beginning with the starters, they have a wide selection of cold and hot starters that can suite any taste bud. But if you aren’t alone, check out one of their cold and hot mezzeh’s for a good sample of their middle eastern tapas starters. You have the Chilled Mezzeh containing hummus (chickpea dip, tahini, garlic, lemon juice, extra virgin olive oil), tabbouleh (diced parsley salad, chopped tomato, green onion, bulgur, lemon dressing), baba ghannouj (fire-roasted eggplant dip with extra virgin olive oil), muhammara (walnuts, hot pepper paste, pomegranate molasses – my favorite), and sarma (stuffed rolled grape leaves, herbed rice, toasted onion) for $14.90. Or the Hot Mezzeh containing cheese böreg, meat böreg, kebbeh, and falafel for $16.90. You also get pita bread to start, which is good, but it’s right out of the bag so nothing special. You can see their famous rotisserie chickens in the window when you walk into the restaurant (half for $12.50). Their chicken is very good, not too dry on the inside and full of seasonings on the outside from their proprietary rub. Other menu items I really enjoy are the kababs, which you can get for chicken, lamb or beef. Sometimes they can be a little overcooked though, which is easy to do when cooking kababs or if they sit too long under the heat lamp before serving, but still flavorful and divine with some garlic sauce on them. 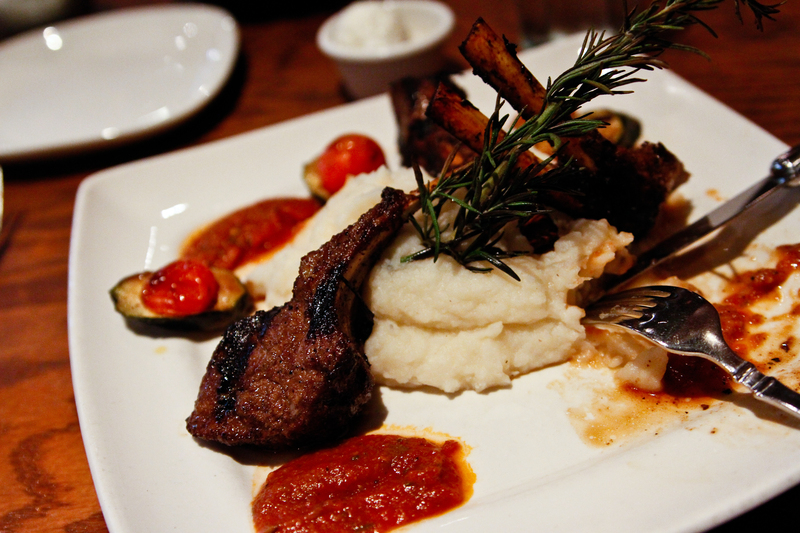 I usually order either falafals or one of their two lamb menu options like the Grilled Lamb Chops with pomegranate and vegetable reduction or the Lamb Shank with juice of red wine, garlic rosemary. Both for $23.95. They are very good, with the shank as my favorite. The chops tend to be medium-well by the time I get them, so a tad overcooked from how I like them, but still very good with their complex lamb rub. Their ratatouille is very flavorful as well, so that makes a hearty, but extremely satisfying side. They tend to put on the side of each plate a few slices of their pickled turnips, which strong bitter, sour taste but nicely contradicts the other flavors on the plate. Combine any of the above hearty stomach fillers with a side of their garlic sauce, you’ve got a happy belly for sure. Atmosphere = B (local, in strip mall, lots of parking, stage for a band?) Note: Updated on 12/30/2012 because of increased seating. As anyone knows who travels a lot for work, eating at the chain restaurants gets old after awhile. Thus when I travel, I first check to see if Anthony Bourdain, host of No Reservations and Adam Richman, host of Man v. Food on the Travel Channel feasted on any local delicacies from the town that I’ll be visiting. Plugging Los Angeles into the Travel Channel’s website from my Droid, (yes I still have an original Droid) I searched for the closest place to El Segundo, California that Adam or Tony consumed some local cuisine. So what gem did I find?… Acosta Tacos located at 4539 W Imperial Hwy, Lennox, CA 90304. This little staple of the local community was exhibited in the No Reservations episode where Tony ate carne asada tacos with some of the local LA gang unit police officers. I didn’t have the entourage that Tony had, but instead a colleague where we decided to get a late lunch before attending another local meeting. As with all restaurants I focus on three things, appearance, service and quality of the food. So let’s begin..
Cruising down Imperial Highway searching for this local establishment, we drove right past it. Pulling a u-turn we pulled into the empty parking lot in the rear of the shack…I mean restaurant. I would have sworn it was closed since no one was around, but the wide open windows and doors and the ‘Yes, we’re open’ sign convinced us otherwise. So the place wasn’t full of eye candy, but that means either the food is really good or really poor. Since it was on T.V., the odds are in favor of the former. It did have character though being a small, older local place characteristic of that area. Walking up to the window in the front we studied the diverse menu full of various beef (beef tongue anyone? ), pork, chicken and fish options while we waited for someone to show up from the back. The gentleman was friendly and politely said “Don’t have any” to the first two things I tried to order, the barboboas and fish tacos. Call me crazy, but if it’s on the menu I expected it to be available? Maybe he just didn’t want to make any since we were after the lunch crowd, but not the best start. So my colleague just ordered 12 tacos (at $1.28 each), 4 carne asada, 4 carnitas and 4 al pastor for the two of us. The kind gentleman got right on our feast of these little munchkins and 5 minutes later or so, we got our little foil wrapped delights. It’s important to note, and I do mean important, that this place is CASH ONLY. Thankfully between the two of us, we just had enough. Partaking of these morsals ontop of our red Chevrolet Traverse hood was a great change of pace from the subpar airport food we have been eating as of late. The tacos were small, ~5″, with the standard double layer corn tortillas containing the taco goodness. The tortillas were really good though, soft and newly steamed for sure. All of the meats were well marinated and full of flavor. In addition, all of the tacos were topped off with a mild tasty fresh tomato, cilantro, onion salsa. I felt that the carnitas were my favorite with the carne asada being a bit chewy from possibly being cooked too long. My colleague was the complete opposite as he liked the carne asada the best. Everyone is different, so I’ll let you decide. You can’t go wrong with any though from our experience.